James Kennedy was born December 9, 1817 in Ballymena, near Belfast, country Antrim, in Ulster Ireland. He was the youngest son of James Kennedy of the "Rampart", Ballymena. James was well educated and studied as an Architect. In 1839, at age 22, James sailed for America. He practiced his profession of Architecture in Rochester, New York. He traveled widely in the United States and visited Wisconsin, Illinois and other mid–western states. 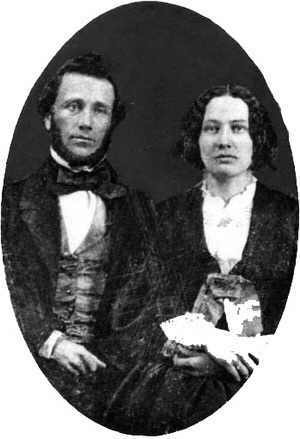 In the late 1840's James moved to Toronto, Ontario and stayed until the early fifties. In 1854 James married, at Whitby, Ontario, Miss Caroline Stone, the second daughter of the Hon. Marshall B. Stone, a United States Senator from Minnesota. On November 1, 1856 their first son James Marshall was born in St. Paul, Minnesota. In the latter part of February 1859, James, Caroline and their son James, two and one half years old, left Ontario, via New York, for the Pacific North West and the newly proclaimed colony of British Columbia. We spent a few days in New York, embarking on Tuesday early in the morning for Panama, crossing the Isthmus by train... in a pleasant run of about three hours. Passengers, baggage and freight were immediately transferred to the steamship which was to take us to our destination. With the beginnings of the Fraser River Gold Rush, when gold was found in the sand bars of the Fraser Canyon, a stampede of golf seekers invaded the colony. To maintain "law, Order and Good Government", the Colony of British Columbia was proclaimed on November 19, 1858 and its capital became Fort Langley. A contingent of Royal Engineers had arrived under the command of Col. Moody. They were charged with aiding the development of the new colony. Moody was pre–occupied with the defense of the colony, in face of the American policy of "Manifest Destiny". The bulk of the miners arriving in the first rush were Americans from California. The potential danger to the colony was that of the United States. 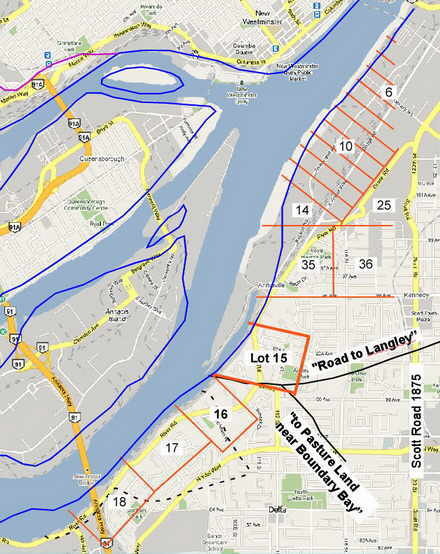 Moody felt that Fort Langley was indefensible and chose a more defendable site on the north shore of the Fraser River. 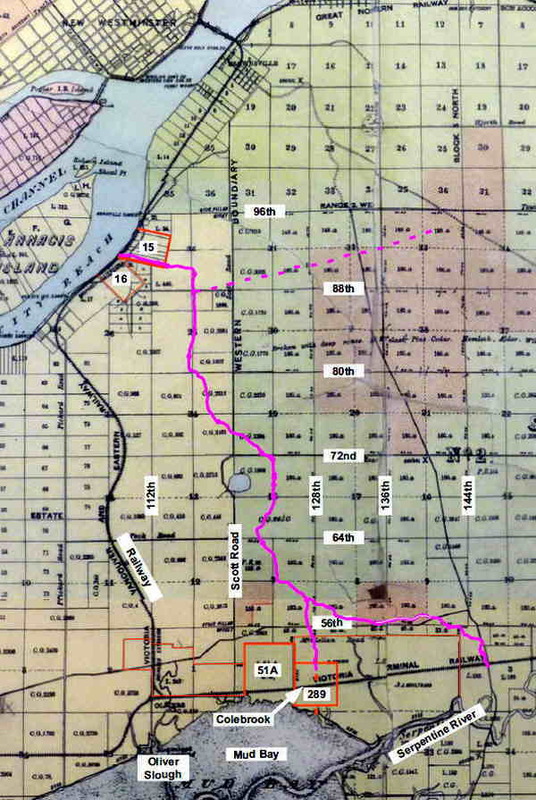 The site chosen was Queensborough at the point the Fraser River separates into the north and south arm. This was a defendable location which controlled access along the Fraser. In 1860, the name of the center was changed from Queensborough to New Westminster upon the suggestion of Queen Victoria. Mrs. James (Caroline) Kennedy was the first white women to arrive in New Westminster. On August 11, 1859 a son George was born in New Westminster. He was the first white child born in New Westminster. James Kennedy tried his hand at many occupations; architect, builder, school teacher, road contractor and ranching. In 1860 James was the first to preempt land on the south shore of the Fraser across the river from New Westminster. While several local history books (and the Kennedy Timeline website) say James Kennedy settled in Surrey that was based on the assumption that his early preemptions (District Lots 15, 24, and 25) were in Surrey. They were in fact in the Annieville area of North Delta. Kennedy believed that the starting point of his 1861 trail to Mud Bay would become the nucleus of an important community and perhaps the terminus of the "The Great Pacific and Atlantic Rail Road". John Macdonald: A summary of the James Kennedy family. He probably also dreamed of moving his family there from New Westminster. The was a birth announcement in The British Columbian in September 1865 indicating that Caroline Kennedy had given birth to their fourth child Thomas "At the Rampart, opposite New Westminster". It's still not clear to what extent Kennedy and family actually lived on the property, although he did build cabins and establish gardens on all three properties. That effort was part of the requirements to maintain the preemptions prior to purchase. However, he improved the properties but for the most part commuted back and forth from New Westminster. There are details in newspaper advertisements Kennedy placed when he was offering the properties for sale beginning between 1864 and 1871. Kennedy moved his family to Derby near Fort Langley in 1867 where he taught school until 1872. Kennedy was paid for the costs of the trail construction, in part with script, that he and his employees could use to preempt property that they in turn could homestead. Kennedy and son Robert owned several quarter sections in Surrey along Scott Road in the "Kennedy Heights" area. The Surrey Heritage Register includes a "Robert Kennedy House" at 12481 Old Yale Road, now the site of a junk yard. It was built in 1892 but it has not established that Robert every lived there. The Kennedy Trail provided access for the first of the settlers to preempt land in the district that was to become Surrey. Settlement lagged initially but increased markedly with the decline in the Fraser River and Cariboo Gold Rushes. Many former miners chose to take up farming or logging and one of the prime areas for settlement was the lowlands of Surrey. November 1, 1856 their first son James Marshall was born in St. Paul, Minnesota. August 11, 1859 a son George was born in New Westminster. August 15, 1861 a son Robert was born in New Westminster. September 1864 a son William Dempter was born in New Westminster. September 18, 1865 a son Thomas born at The Rampart opposite New Westminster. November 18, 1867 a daughter Mary Emily born in Derby near Ft. Langley April 8, 1872 a son Benjamin Stone born in Fort Langley. In 1866 The Crown Colonies of Vancouver Island and British Columbia are united and named British Columbia. The capital was New Westminster but in 1868 by a vote of the Colonial Legislature the capital became Victoria. In April 1867 Langley's first school opens in Derby and James Kennedy became the first teacher. He moved his family to Derby near Fort Langley in 1867 where he taught school and later transferred to the school in Fort Langley until 1872. In time Kennedy returned to New Westminster and to his vocation as an architect and builder. He acted as a superintendent for the Dominion Government in the construction of the Federal Post Office building in New Westminster that was later destroyed by the fire of September 10, 1998. He acted in the same role for the Provincial Government in the construction of the Provincial Asylum for the Insane. He designed and constructed a number of the business blocks in the city. James Kennedy, while living in Langley, advertised a sale of stock and land of his old pre–emption downriver from Brownsville. James Kennedy's sons George, Robert, and James became owners of The Columbian newspaper in New Westminster between 1888 and 1900. They were actively involved in provincial and federal politics through their newspaper. They later established Kennedy Brothers Reality in New Westminster. Their brother John (James junior) also worked at the Columbian. As for connections to Surrey, Kennedy and son Robert owned several quarter sections in Surrey along Scott Road in the "Kennedy Heights" area. In 1911 Kennedy's son Robert married at the age of 50, and around 1914 started a farm in Pit Meadows. He later moved back to New Westminster. After completing his education in New Westminster Kenned'’s grandson Robert Pemberton Kennedy continued with the family farm in Pit Meadows. (There is a Kennedy Road in Pit Meadows as well as New Westminster.) In 1959 Robert Pemberton Kennedy moved to Tappen in the Shuswap area of BC. Other members of the Pemberton–Kennedy family soon followed. The Surrey Heritage Register includes a "Robert Kennedy House" at 12481 Old Yale Road, now the site of a junk yard. It was built in 1892 but I have not established that Robert every lived there. The 1901 Census shows Kennedy's sons James, George, Robert, William, John, Benjamin and daughter Mary living at the family home in New Westminster. The 1911 Census lists George, Robert, Fanny, William, and John Kennedy living with their mother in New Westminster after the death of James Kennedy senior in 1902. The Surrey Heritage Register also lists a "George Kennedy House" at 9948 123A Street which was built in 1914. This address would have been on one of Robert Kennedy's quarter sections. Again, no evidence yet that he actually lived there. George was the New Westminster Postmaster from 1900 to 1910 and died in 1934 at his home in the Burr Block apartments at 411 Columbia Street in New Westminster. There is however one Kennedy son, Thomas who I can confirm did live in Surrey, at least it appears, in his retirement. Thomas is the one said to have been born on Kennedy's Ramparts property in 1865 (but that was not in Surrey). John Macdonald: A summary of the James Kennedy family. Thomas Kennedy (age 31) married Elizabeth Allanson in 1896 and they had seven children. He was a sheet metal worker and a partner in Mahony & Kennedy, a plumbing & heating business. He lived most of his life in New Westminster and died at home at age 78 on his dairy farm at 1462 Kennedy Road in Surrey in 1943. "1462 Kennedy Road" appears to have been just east of his father's quarter section along 88th which ended at 124th Street. Benjamin Stone Kennedy died at home at 1371 Gray Road (80th Avenue) in Delta BC on March 07, 1944. He learned the printing business working with his brothers at the Columbian newspaper and was later a publisher and printer in the Fraser Valley. None of his eight children appear to have lived in Surrey. John Macdonald: A summary of the James Kennedy family. A summary of the James Kennedy family: John Macdonald email correspondence.